Are you looking for different ways to earn money right from home? There does exist several such jobs. In fact, people are now well familiar to working from home and many have their own office space in their dwelling place. You also can locate tons of jobs that allow you to make money from home. In today’s world, online jobs are available to those who do not like routine office work and instead want to be their own boss. Or, those who look for some additional income source can try out many such part time jobs from home. Online jobs are an excellent source of earning a part-time and full-time income. Many people use online jobs to make a supplementary income. Others prefer exploring many job opportunities from home to keep their freedom intact. But what are the best jobs for you? While there are online jobs available for almost all the skills, some of them are commonly explored by most people. Even with little or no experience, you can plan your own online store. You will not need tons of money to start this business. In fact, many people started out without any financial or business background. All you need to do is to keep your interest on and it will prove to be a lucrative career option. To successfully start your online store to make money from home, first, know your niche. What exactly you want to sell from the store? Do some research to know which products are trending amongst people. Try to sell those products so that there is not a lack of demand and sales increase easily. You should also choose if you want to opt for drop shipping or want to hold products on your own. That is an important decision depending on your financial and other resources. Also, come out with a catchy business name and register it as your domain name. Make sure that the website you create for your online store is user-friendly and impressive. Sites such as Shopify can be an inspiration. You should set up a company. Apply for a sales tax ID as well. Make sure that you market your online store extensively so that people are aware of your shop and buy from it. You should also create a logo for your online store so that people can recognize your business. The logo will help in establishing your store as a brand. Blogging is one of the best ways to make money online. If you boast of good writing skills, blogging should be an easy and automatic choice to earn money. You can start a blog right away in some easy steps. Just pick your blog’s name and domain. Choose a name based on your interest in a field such as travel, health, cooking, finance, technology or anything else. Then, find a hosting services provider so that your blogging site is always visible to your audience. You should also choose a Content Management Service, which is your blogging platform. Hire a professional graphic designer who can design your blogging website. The site should be user-friendly. It should load quickly in a few seconds for the viewers. The website must have essential pages such as About and Contact. Once the site is ready, just start writing and posting your blogs on the issues that interest you. Here, make it certain that you post blogs regularly, which is a key to earn money. After your blog has built a solid audience base and traffic regularly comes to it, monetize your blog. You can publish ads from various source on your blog sites. Many sites offer you an opportunity to take part in surveys and earn. They ask you to do some online surveys regarding products or services. But you will be spending your time in this activity. Just do some research about some paid survey websites and apply as your best means to make money online. Many such sites are easily accessible today to people who want to make money from home. Amongst these survey sites, prominent ones include Swagbucks, Survey Junkie Inbox Dollars OneOpinion American Consumer Opinion, and Pinecone Research. If you deal with how to make money online, then opt for this offer. Most such sites are good sources of not only money but they also reward you with gift vouchers, free products, and prize drawings, etc. You can sign up and use these sites free. But do not get trapped by a site that asks you to pay as it is probably a scam site. If you are interested in surveys, here are some more survey sites you can explore: PaidSurveys, ProOpinion, Opinion Outpost, MySurvey, My Soap Box, and Global Test Market. Looking For Freelance Graphic Design Jobs? We have helped thousands of designers and artists from all around the world in finding freelance graphic design projects that include logo design, website design, social media page design, banner design and a lot more. Do you love to be surrounded by cute babies? In fact, we all. But how about turning that love for babies into earning money in your spare time? Many people become babysitters to make money from home. The web is home to many sites that show up babysitting jobs and opportunities. Sites such as Care.com and SitterCity are worth exploring to look for the job. These credible sites verify babysitters and let people who seek sitters know about your interest in the job. The sites make some background checks before approving you to potential clients. How much you can earn? That depends on your experience. The number of children you need to handle and hours per week you spend will determine your earnings. But average hourly rates for babysitters is $28. Many sites have calculators to show how much you will earn as a babysitter based on your experience. A virtual assistant is the one who provides services to business owners sitting afar online. Some people take the assistants as someone who is a little more than an executive assistant. But it is not as simple as that. No doubt that some assistants perform conventional administrative works as well. But this job is diverse. In fact, this is one of the tips that experts give for working from home. The job of a virtual assistant includes scheduling appointments, social media management, formatting, email management, travel, and others. The basic thing to understand here is that you are paid for anything that you do for your client’s business. Here is what you need to do to make money from home as a virtual assistant. First, choose a business structure that you are interested in. You must precisely know the services you can offer to your potential clients. At the same time, determine your pricing structure. Make sure that you demand a fee that is good enough to earn you decent money. Then, build a good online presence for your virtual assistant services. To do that, create a nice website that displays and promotes your services. You should also start pitching clients and do some networking as well to get noticed. For more job opportunities in this field, build good relationship with clients to maintain workflow. In this age of marketing, you can earn make money from home even doing some interesting and fun activities. One such activity is to watch videos and movie previews in your free time. What could be more interesting than earning money from watching celebrating videos, news, and many other videos? Many sites such as Swagbucks allow you to earn by watching videos. They ask you to watch videos for a given number of minutes and you should like them. You can explore many sites including Swagbucks, Inbox Dollars, Perk.tv, Viggle, Nielson Digital Voice, Slidejoy, and others. These are great sites when you are struggling to find out how to make money online. For example, Netflix, the most popular video streaming service, hires ‘’taggers’’ whose job is to watch and tag their entertainment programs. Your job will be to watch and recommend the programs to fellow subscribers. Another way that many people use to make money from home is to test websites. Clients want to test their websites and apps for software bugs and incompatibilities. They also want to know how user-friendly their site is for their audience. When you last visited a website, did a thought that the site is bad or good occurred to you? Some websites are great while others are less impressive or even outrightly bad. So, how about someone paying you for sharing your views about these sites? Well, testing a website is actually pays nicely. For example, a website testing site User Testing pays even up to $30 per hour. When you use these sites the clients will record your activities and voice on their screen. So, the client will be watching you while you test a website. The sites that pay for testing websites include User Testing, Userlytics, TryMyUI, UserFeel, and TestingTime. If you qualify, many such sites are willing to pay $10 per user testing session. If you have any interest in teaching students and imparting your knowledge, you can earn nicely from home. Just go for online tutoring. You can teach adults, kids or college students depending on the skills and experience you have. Even retired people can opt to be online tutors from home. As far as earnings are concerned, you can get as much as $20 per hour and more on many sites. How about writing product reviews and earning money. Well, it is today considered by many as amongst the best ways to make money from home. Depending on your skills and experience, you can make even up to $50 per review. Product reviews have become essential today as consumers find taking a buying decision difficult. They, then, go to the review sites and get a recommendation from the users of that product. Many product review sites can pay you good money. These sites include CNET, ConsumerSearch, Viewpoints, DP Review, Test Freaks, America’s Test Kitchen, YouTube, GoodHousekeeping, and Good Guide. Graphic designers can explore many online sites to enjoy a healthy regular earning from home. In fact, many freelancer designers get paid handsomely. They make money from home using their design skills and experience. Just create a dedicated space in your home to do designing work for online clients and earn regularly. But where can you sell your graphic design services to get clients? There are multiple marketplaces dedicated to designers and business owners who need logos etc solutions. You can approach these sites easily and start getting work. Many prominent marketplaces such as Designhill let you have access to clients for work. Business owners come to these sites to launch their design contests to create a logo design and other visual identities. They announce attractive prize money, which you can win. If you have the skills, you can win many prizes on these sites. You also come closer to the potential clients on these sites and get work from them due to your good reputation. 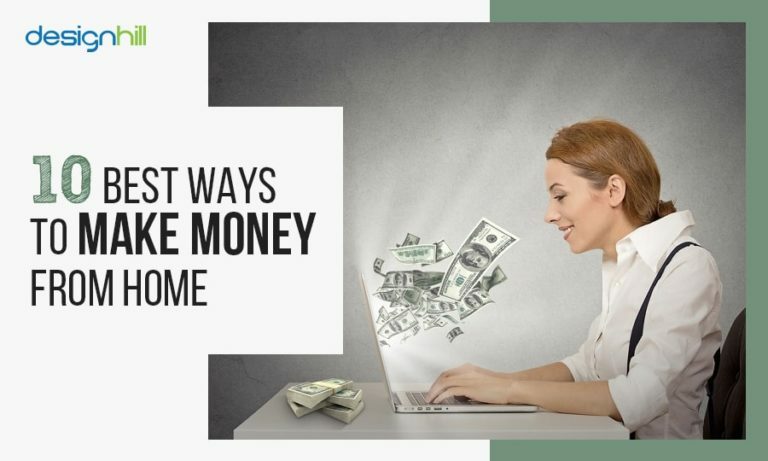 These key options are the ones that you should be exploring amongst others to make money from home. But have patience. You should spend more time to focus on developing yourself into a brand to get work from clients regularly. If you wish to be your own boss and still earn your livelihood, you have many opportunities to explore to make money from home. Depending on your skills, dedication, and experience, many such jobs are excellent to make an excellent earning. You can explore many online jobs from home.